When it comes to eating healthy, the phrase "eat like a rainbow" is the mantra we all should seek to live by. By getting a variety of different colored fruits and vegetables you not only maximize your intake of a broad range of nutrients, you are also guaranteed a diverse amount of essential vitamins and minerals. "Nature has endowed each fruit and vegetable variety with certain vitamins, minerals, fibers and more," said Lilan Cheung, director of health promotion and communication with the Harvard School of Public Health. 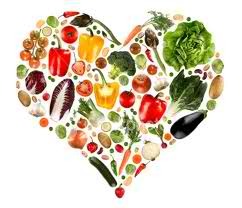 Everyone should be eating nine or more servings of fruits and vegetables per day," Cheung said. "The more, the better! "No single food contains all the necessary nutrients, but different plant color groups when eaten in combination fulfill the average person's daily requirements. • Red: Tomatoes, beets, radishes, red bell peppers. Lycopene, found in tomatoes, is known to reduce prostate cancer risk. • Green: Spinach, broccoli, brussels sprouts, cabbage, green peppers, kale, collard greens, peapods, asparagus. "Phytochemicals lutein and zeaxanthin are found in spinach, collards, kale and broccoli," Cheung said. "These antioxidants may protect the eyes and fight against free radicals - harmful substances in our body caused by smoke and pollution." • Yellow and orange: Carrots, pumpkins, yellow peppers. Especially rich in beta-carotene, which strengthens the immune system. • Blue and purple: Eggplant. Loaded with antioxidants called anthocyanins that may prevent heart disease by blocking the formation of blood clots. • White: Garlic, white onions. "These pungent vegetables add flavor to foods so you can cut back on the salt," Cheung said. "The onion family contains allicin, which has anti-tumor properties. Garlic is being studied for its potentially beneficial role in preventing heart attacks and strokes, although the research is still preliminary." Phytochemicals have been shown to slow the growth of tumors, and researchers have identified probable evidence that fiber protects against cancer. Beans are also a great source of vegetable protein, which is helpful if you are limiting red meat intake. Blueberries contain anthocyanosides, possibly the food kingdom's most potent antioxidants, which attack cell-damaging free radicals. Studies suggest these veggies fight cancer by regulating enzymes in the body. Research suggests the carotenoids act as antioxidants, eliminating possible cancer-causing free radicals from the body. Flaxseed contains more lignans than any other known food. These phytoestrogens seem to mimic the hormone estrogen. Note that flaxseed oil does not naturally contain lignans. Research shows a “dose-response relationship” with garlic. That is, the more you eat, the higher the protective benefits. A 2007 study by Japan's National Cancer Center showed that men who drank five or more cups a day may reduce the risk of advanced prostate cancer by 48 percent. Researchers say pomegranates, which have high levels of antioxidants, have more anti-inflammatory properties than green tea or red wine. Resveratrol has antioxidant and anti-inflammatory properties. Although wine contains resveratrol, research also shows a link between alcohol and other types of cancer, so it's not the best choice. Jam and raisins don't contain much; eat fresh dark-colored grapes. Researchers believe soy isoflavones mimic hormones in the body, which may translate to cancer-fighting capabilities. Researchers also recommend that because of possible hormone mimicking, women taking anti-estrogen medicines should limit or avoid soy until more is known. It appears the red fruit's cancer-fighting potential is higher when the tomato is in sauce, juice, or paste form. The phytochemicals from whole grains appear to protect cells from the damage that can lead to cancer. The disease-fighting nutrients and fiber found in the bran and germ of grains are stripped out in the milling of refined grains like white flour, white rice, and pasta.